So, how far is a director’s responsibility supposed to go? Is one supposed to try to satisfy everybody’s tastes, expectations and moral orientation? I think these questions probably have more to do with Tarantino than with any other active director. The guy gets glorified, but then he gets slaughtered too. From what I’ve heard from him, he is smart enough to generally stay away from commenting back on the innumerable attempts to dissect his greatness/lameness. Maybe this is not only the best approach, but the single one he can have. You will never make the entire world happy, so you’d better just keep your mouth shut, and stick to making movies. Tarantino’s latest, Inglourious Basterds, is no exception to the rule – the movie is adored and hated. I quite enjoyed it. Even more – coming out of the theatre, I thought “This will be an all-time great.” I’m no movie critic – when I write, I only do it to try to understand a movie better (hmm, this actually might make me a critic, I don’t know). I haven’t read or studied enough of film history or film philosophy or film aesthetics. So after I see a movie, I like to have it “explained” to me again, by different people, with various points of view. And this is how I came across this article. Senses of Cinema is a very good film critique website, I believe, and writings there are deep, informed and thoughtful, though sometimes too dry and complex even for the deliberate reader. But some articles there can be quite inspiring – like an interview with Terry Gilliam they had published recently that made me delete my Facebook account. This one, on the moral grounds of Inglorious Basterds, had me really thinking, even if I had to read some sentences three times to get what they mean. Basically, the article says two things. One, Tarantino has done an exceptional job in most scenes of the movie, succeeding to draw the audience to unwittingly identify with some of the Nazi characters (especially Colonel Hans Landa, played exquisitely by Cristoph Waltz). 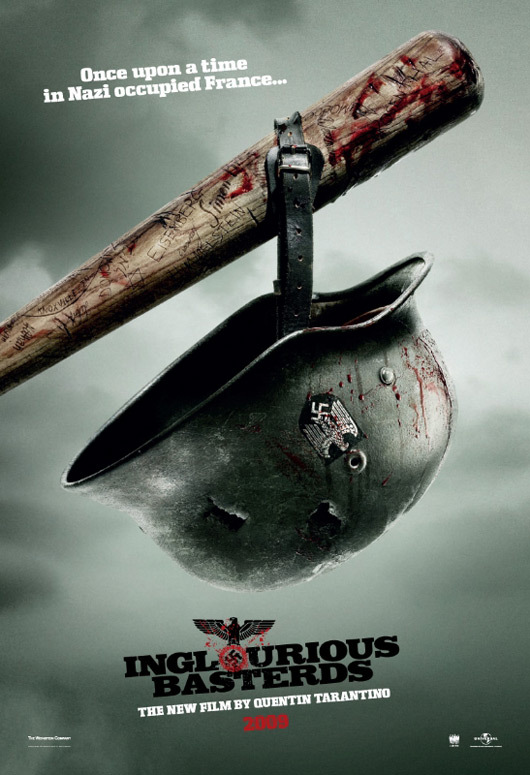 Take two suspense-laden scenes, for instance – the opening with Landa interrogating the French peasant, and the one in the underground pub, where the German SS officer plays a game of cards with some of the Basterds and the German actress. In both, we have a bad guy – a Nazi – slowly and excruciatingly teasing the truth out of the “good guys” – and we can’t help but feel with the Nazis’ skins, anticipate through their minds. And that’s an accomplishment for the writer and director. Two, you can’t just take a real historical moment, and one laden with such heavy moral importance, and turn it into pulp fiction. Tarantino has fucked up the whole point of remembering the Holocaust, he is smearing history, even deleting it. I don’t agree with that second one. To me, Tarantino should be able to enjoy some leniency from his fiercest critics even if only because of the closing scene of The Basterds. The one that takes place, remember – in a movie theatre. Where the final destruction is based on the sacrifice (or should I say – self-sacrifice) of a giant pile of film material and of the theatre’s projection screen. To me, it was a metaphor of cinema taking things in its own hands. Correcting history, the way we all have always wanted it corrected, within the realm of cinema’s own imagined world. Cinema reveling in its power – the power to which Tarantino has always bowed down to. Cinema giving us what we’ve always expected from it – a distraction that is a satisfaction that is an inspiration that is a change within us.